A disturbingly eerie visage from The Twilight Zone. '70s style action figure based on the episode entitled "The Masks." The Masked Man features fabric clothing and multiple points of articulation. He's sure to set the proper mood to your next get-together! We entered The Twilight Zone and found limited stock on this item! 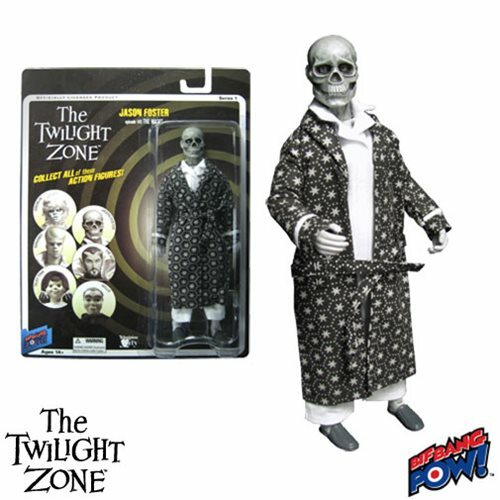 An eerie robe-clad visage right out of the 1964 The Twilight Zone episode entitled "The Masks," this spine-chilling action figure from Bif Bang Pow! is sure to set the proper mood for your next Marti Gras eve get-together. Designed in a retro 1970s style with fabric clothing and multiple points of articulation, the Masked Man stands 8 ominous inches tall. Whether an inheritance is at stake or not, you're going to want this incredible figure in your Twilight Zone collection!